← Day 41: Make a Speaker. Log Driver’s Waltz (a 3 minute Vignette, which is reportedly an Alberta classic, at least according to LeLa; this one was new to me). 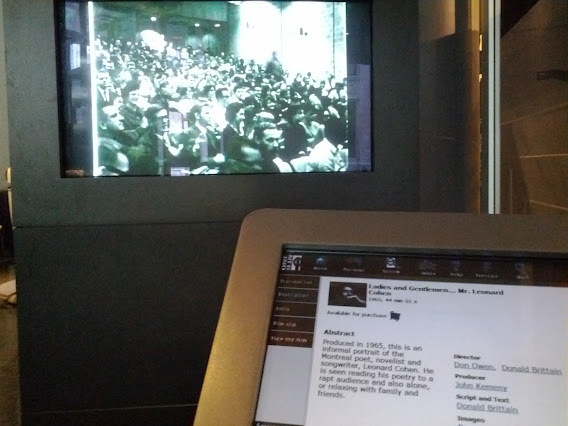 Today, I visited the NFB Toronto’s Mediatheque, which houses a library of more than 6000 films, all available for free to the public to watch from the comfort of their own personal digital viewing station. For real. In a word? Amazing! In addition to attending events, screenings, and renting space there, you can also buy or rent DVDs from their boutique, including David Suzuki’s Force of Nature. Not to be outdone, the NFB website also allows you to view over 2000 titles on-line from the comfort of your own home for free, and to save your own copy for a nominal fee. Hmmm… Looks like I’ve found a new wormhole to crawl into whenever I’m miraculously caught up on email, Facebook and Twitter. Well played, Mr. Procrastination, well played. 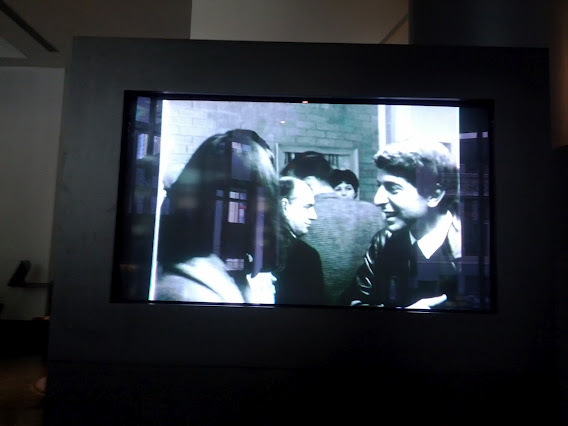 Anywho, back in the building this afternoon, I settled into my cozy chair with my personal surround sound to watch the 44 minute black and white classic: Ladies and Gentlemen… Mr. Leonard Cohen – circa 1965. This film opens with a young Leonard (no, not the one from the Big Bang Theory) talking to a room packed full of literary too school for cool types, that strangely look as though most of them just walked right out of a Starbucks. In any event, he effortlessly delivers stand-up commentary that is deliciously deadpan, yet charmingly witty and with a boyish guile that the audience simply devours. From there, the camera follows him as he meanders through his low-budget, carefree and smoke-filled lifestyle, pausing on occasion to emphasize his secretly industrious and virtuous nature. People are drawn to his magnetic persona, and you instinctively want to be part of his entourage, even today. I can see why it’s a classic. 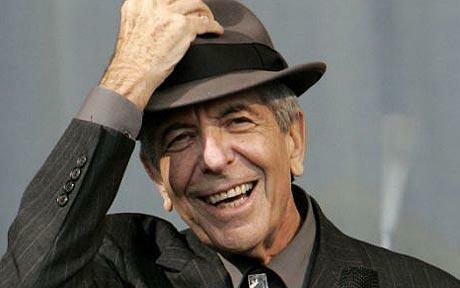 As a child of the seventies to straight-laced parents who would occasionally venture out of their classical comfort zone to dabble in some dangerous jazz, I don’t remember hearing much about Leonard Cohen when I was growing up. It wasn’t until Closing Time hit the airwaves in 1993, and I was living in a house full of waiters and cooks for the summer, that his writing and sultry voice really entered into my consciousness. Until then, I had no idea that he had published books as both a poet and an author prior to becoming a songwriter. Today, I further learned that he was the president of the McGill Debating Union, attended a term of law school, received the Order of Canada in 2003, and has since been lavished with countless other literary awards. He even made a guest appearance on Miami Vice. True story! As if all of that weren’t enough, he was also ordained as a Buddhist monk after spending 5 years in seclusion in the late 1990s. Apparently, it was this Zen Buddhism that later lifted him out of depression. In 2010, at the ripe young age of 76, he played a four-hour concert in Sweden, which was part of a 3-year tour. I mean, who does that?!!? He’s even been referenced in a Nirvana song. Not too shabby for a Jewish boy from Montreal. Coincidentally, April is National Poetry Month at the NFB Mediatheque, and this particular Leonard Cohen film is being screened there next Wednesday, April 18th at 4 pm, as part of their ‘Favourites at Four’ screenings, at the very reasonable price of: free. I highly recommend it if you can swing it. Needless to say, I followed up the movie with The Sweater, and The Cat Came Back, to round out my delightful viewing experience, as what trip to the NFB would be complete without them. 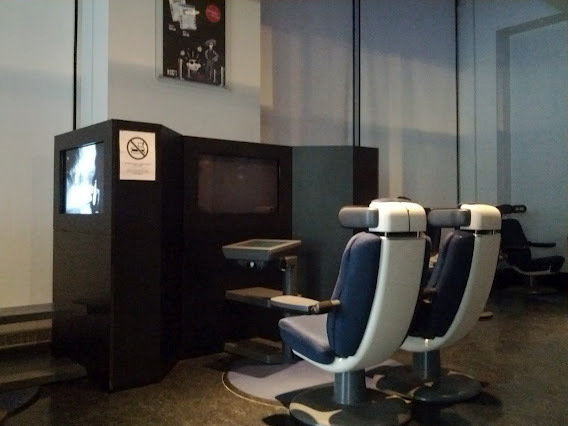 The interactive touch screen in the viewing station allows you to search, pull up and view any of their films without ever having to leave your seat. I could get used to this! If only they made a female version of the Stadium Pal… Sigh. This entry was posted in Educational and tagged April, Cat Came Back, David Suzuki, Educational, free, Hockey, Leonard Cohen, Mediatheque, National Film Board, NFB, Sweater, Toronto. Bookmark the permalink.